Is this scene as confrontational as it seems when viewed in the light of the 1824 campaign? History teachers could not help but chuckle when they saw this picture from the second presidential debate during the 2012 campaign. In it, the incumbent Obama and the challenger Romney seemed to be sparring aggressively. As confrontational as this picture seems, though, history teachers cannot help but laugh when they compare this relatively mild scene to the Election of 1824. The Election of 1824 spelled the end of the Era of Good Feelings. During the Monroe administration, it seemed to many Americans that partisan politics has eased significantly. With the death of the Federalist Party as a formal body, there only appeared to be one political party in operation, that being the party of the Jeffersonian Republicans. However, partisanship returned in full force when the followers of the two major candidates, John Quincy Adams and Andrew Jackson, began spewing vile at each other. The Adams’ camp leveled charges of adultery, illiteracy, and homicidal violence at the feet of Jackson, whilst the Jacksonites claimed that Adams wore silk underwear, gambled, and had served as a “pimp” for the Russian czar. Indeed, both parties continued to duke it out even after the election, as charges were leveled that Adams had won because of a Corrupt Bargain. Edsitement is a wonderful resource for teachers. It includes a digital library full of lesson plans. Here is one lesson that helps students understand the issues behind the Election of 1824. Perhaps this lesson can help students have some context for truly partisan campaigns to compare to this current one. Almost every modern presidential campaign has used fear and other emotive tactics to attempt to persuade voters. The last post on this blog highlighted the fear-mongering of the LBJ camp against Goldwater in the 1964 election. Democrats are not solely guilty of utilizing this method, however. Republicans have used fear in political advertisements as well, as seen in the Reagan campaign of 1984. Reagan’s campaign slogan for 1984 was “Morning in America.” Most of the televised campaign ads endorsed by the Republicans were upbeat, optimistic, detailing a strong economy and gains on the Cold War front. One ad, however, was noted for its exploitation of American fear of the Soviets. The ad was simply called “Bear” and can be viewed here. The ad opens with a calm, serene narrator speaking about a bear in the woods. 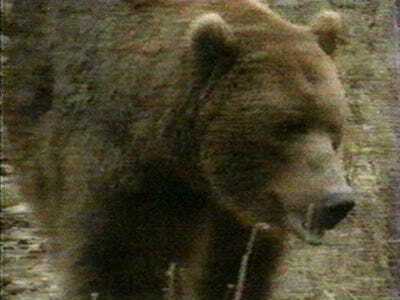 As the commercial progresses, it becomes obvious, through the usage of ominous music and a loud heart-beat sound recording, that the bear is a threat. Most Americans came to the conclusion that the threat the bear symbolized was the USSR, although the ad never directly stated this. This ad has been analyzed for its subliminal affect on viewers. The ominous music coupled with close-up shots of the beast evokes a sense of dread. Additionally, the heart-beat sound works to intensify feelings of fear. Notice, as you watch the commercial again and again, how your own heart beat begins to mimic the sound-over. Further, the fact that the viewer would almost inevitably conclude that the bear symbolizes the Soviets, despite the fact that this only indirectly implied by the commercial, effectively manipulates a person’s ability to jump to his/her own conclusions via inductive reasoning. Reagan’s landslide victory may not be directly attributable to his lone ad. However, it demonstrated how masterfully he and his advisers were able to use television to persuade. For teachers who enjoy analyzing media influences on presidential elections, The Living Room Candidate is a very useful site to employ in class. Presidential campaign ads are often intended to evoke emotive responses from the intended audience. These televised spots are usually devoid of substance, instead using fear as an agent of persuasion rather than speaking to issues. In 1964, the Johnson campaign utilized this tactic masterfully. Johnson was running against Barry Goldwater. Goldwater represented the conservative backlash against civil rights agitation, against the War on Poverty, and against stalemate in Vietnam. His campaign slogan was, “In your heart, you know he’s right.” Ads like this one–Peace Little Girl–attempted to paint Goldwater as a war-monger, who would be quick to pull the nuclear trigger in order to win the conflict in Southeast Asia. As the ad shows, Johnson played on fears that a nuclear strike against American enemies would lead to massive retaliation and nuclear devastation in America. Indeed, liberals turned Goldwater’s slogan around, saying instead, “In your guts you know he’s nuts.” Ads like these helped contribute to Johnson’s landslide victory. Is it not amazing how a president can be very popular during his time and yet be evaluated downwards in subsequent years, as some have said of Eisenhower? Is it not equally amazing that some have been so pitifully unpopular that they decide to not run for reelection, as in the case of Truman in 1952 and LBJ in 1968? Similarly, sometimes approval ratings mean nothing, electorally speaking, as Truman proved in 1948. Presidential approval ratings have been tracked since 1941. The American Presidency Project from UC-Santa Barbara has compiled thorough listings of these statistics since FDR. The general index can be accessed here. To view each president’s ratings, simply click on their name in the drop-down box. The American Presidency Project is a very detailed web resource for all manners of subjects related to the presidency. 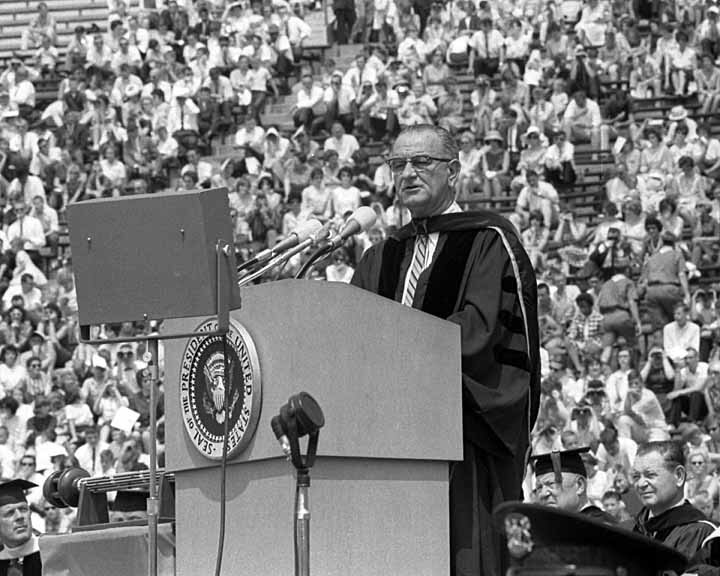 Put on by the University of California at Santa Barbara, this digital library covers topics ranging from presidential approval ratings to party platforms to White House staff budgets. The upcoming election provides social studies teachers many opportunities for linking the present to the past. The American Presidency Project offers a detailed set of statistics for past presidential elections. By visiting this site, teachers and students can glean, compare, contrast, and analyze past presidential election electoral and popular vote tallies. Additionally, teachers and students can determine which way their own state went in that election, as each election year link has not only whether the state went red or blue that year, but it also has a break-down by state of how many electoral and popular votes went to each candidate. The common person did not always hold the electoral clout the he does today. Political parties were dominated more by party elites in the Early National era. One example: the term “King Caucus” refers to the system in which party elites would choose nominees for major national offices. The common person had little input for nominations. Additionally, the common man had less of a say in the choice of President. Electoral College delegates were not required to follow the popular vote tallies–that is, in times and places where the people at large were even permitted to say any role in the choosing of the President. The Jacksonian Era saw a major shift in the role that the common person played in political campaigns. Primaries were introduced in this era and participation in them were broaden to include more than just elites. Thus, “King Caucus” died. Further, Electoral College delegates were increasingly chosen by the common person. The common man began, during this time, to be courted for his partisan support. Political activity increased exponentially, as the people were increasingly engaged at all political levels. Certainly, by 1840, a more modern system emerged in which two political parties mobilized the masses in order to win political office. Teachers of Advanced Placement United States History (APUSH) are familiar with the document-based question (DBQ). The College Board, which operates the myriad AP programs, has a website that allows teachers access to many helpful resources concerning the DBQ. A previous APUSH exam had students analyze the rise of political participation during the Jacksonian Era. Even if you do not teach APUSH, this website can be a tremendous boon to adding critical thinking into the classroom. Teachers can give this document set to students to introduce the the question of the rise of political participation during the Jackson Era. Teachers could then have students analyze the documents using this DBQ Analysis Sheet from APUSH guru Warren Hierl, or can have students write an essay answer to the DBQ. Additionally, in helping prep students for the DBQ essay, teachers can print these analysis aides for interpreting the documents. This link also includes a long list of specifically factual information terms that could be useful in providing a breadth of content. There is also a scoring rubric given. Finally, this site provides teachers with sample student responses. Scroll down to the end of this PDF in order to view them. The history of third parties is a very interesting study. Typically, their electoral success is minimal-to-none. However, some ideas of their platforms are often absorbed by the major parties. In essence, their legacies are found in some of the policies enacted by administrations of subsequent mainstream politicians. The Populists were no different. The late 1800s represented their heyday. They achieved some success at the state levels through such legislation as Granger laws and by electing some governors. At the national level, Congress even seated members from their ranks. They were unable to achieve electoral success in the presidency, however. Their best chance in this realm came in 1896, when the Democrats nominated a champion of many Populist ideals in trumpet-voiced William Jennings Bryan. He, however, was defeated soundly by Ohio Republican William McKinley. Stanford University has a wonderful department in their education school called Stanford History Education Group (SHEG). SHEG has produced a series of lesson plans, called Reading Like an Historian, that utilizes primary sources as the driving factor behind achieving student interaction with the past. These inquiry-based lessons are posted on their website. 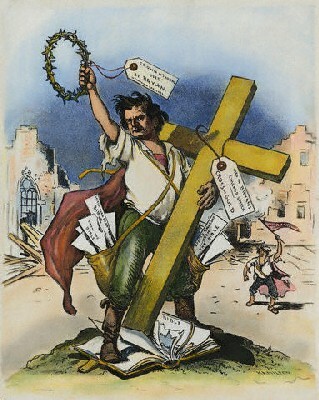 SHEG’s lesson plan for Populism and the Election of 1896 can be found here. Accompanying the lesson is also a link to a PowerPoint and a set of primary sources that align with the topic. Additional lessons from the Gilded Age are also posted on the Reading Like an Historian website. Teachers who apply and are accepted get to spend a weekend studying the Founding at the home of President James Madison. The classroom environment is unmatched, the instructors are superb, and the cost is low, low, low. The fee is $1250, but private donors pay for all expenses save a $50 registration fee charged to accepted applicants. This series of professional development opportunities are called the Montpelier Weekend Seminars. In order to view the names of the different seminars, their respective dates, and to start the application process, visit the Center for the Constitution’s Classroom Seminars page. The Montpelier Classroom Seminars are a unique professional development opportunity for social studies teachers and other civic educators. Participants in a Montpelier Weekend Seminar will live and study on the grounds of James Madison's Montpelier, one of the central sites of the American constitutional founding.